Tetrad NG72A was visited by a party from the 2005 BSBI Field Meeting on Skye. They visited the eastern side – Allt nan Con and Loch an Ime. This was clearly not a rich area as they recorded only 75 taxa. Memory suggests it was a pretty wet day, too. (I was leading another party at the time.) These were the only records for this tetrad. Yesterday I went to see if I could improve matters. I intended to visit the western side but starting over at the eastern edge as that is the nearest road. However, the Allt Mòr was in full spate and despite being in wellies, the depth and flow persuaded me not to cross it. So I collected a Hieracium specimen and drove round to the Sleat road so as to approach from other side. This, it turned out, meant navigating an enormous sea of Molinia. Once I reached Loch na Feithe Seilich and Loch Glac Mairi Nic Colla I added a few aquatics including Utricularia stygia (Nordic Bladderwort) (confirmed once home by examining the quadrifid hairs on the bladders). However, the Allt Choire nan Clach turned out to be one of those pleasing Skye burns with rocky gullies and a diverse flora such as Arctostaphylos uva-ursi (Bearberry), Juniperus communis subsp. nana (Dwarf Juniper), Populus tremula (Aspen), Rubus saxatilis (Stone Bramble) and so on, such that the taxon count now stands at a much more respectable 144. 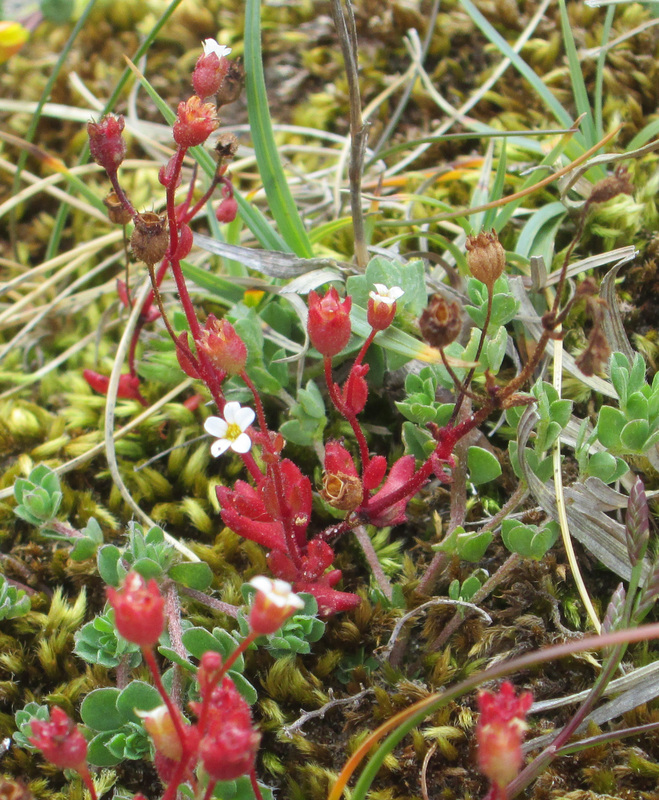 On Friday Seth, Tony and I went to Oisgill so that I could show them Ribes spicatum (Downy Currant) and Saxifraga oppositifolia (Purple Saxifrage). They had to take my word that the Ribes is this species as it has yet to sprout any leaves let alone flowers, but there is a good population of over 60 plants there. The saxifrage, however, was flowering well as expected at this time of year. We added eight taxa to the tetrad plant list, though two of these were the result of subspecies recording, captured some ants and spotted other invertebrates before moving on Abhainn an Lòin Mhòir near Dunvegan. Here we added 12 to the tetrad plant list – the result of my not having recorded along the river gorge before – and did well for stoneflies, river limpets and native flatworms. Seth tells me that a large stonefly that had to be collected from my face was Perlodes mortoni, a recently split endemic (previously lumped with the Continental P. microcephalus). The day started well with a golden eagle flying slowly past the window during breakfast, pursued by a heron and squads of hooded crows and herring gulls. Tuesday saw the second Skye Nature Group expedition which seems to have gone well – slugs and snails, pseudoscorpions, centipedes and white disco fungi featuring amongst other finds. I was sorry to miss it but had a better offer! Rare Invertebrates in the Cairngorms – A lesson in treasure hunting. In the past I have driven to the end of the road at Geary in order to hasten to the botanically rich Geary Ravine SSSI. Today I stopped a little sooner and had a go at tetrad NG25Q, in particular the coastal woodland. This tetrad is unusual in VC104 in that there were lots of records (155) from before the year 2000 but none since. There is one other in a similar category with 96 earlier records but none recent, but that is more difficult to reach. The reason for all these earlier records at Geary is a 1996 visit by Jackie Muscott and the Edinburgh Natural History Society. Despite the earliness of the season, I was able to re-find the majority of the previous records – and add some more. The woodland ground flora was at its best, flowering before being shaded by tree leaves. Along the road there were some interesting escapes like Myrrhis odorata (Sweet Cicely), Tolmiea menziesii (Pick-a-back-plant), Rubus spectabilis (Salmonberry) and Symphytum x uplandicum (Russian Comfrey). Clearly a Balea, just need to check the species….. see comments below. and says that the rust on Brooklime is probably Puccinia veronicae on a previously unknown host, but wants the specimen I took. Yesterday I completed the field work for this round of Site Condition Monitoring in the Raasay SSSI. The target species were Dryas octopetala (Mountain Avens), Epipactis atrorubens (Dark-red Helleborine) and Pyrola rotundifolia (Round-leaved Wintergreen). This remains the only known site in VC 104 for Pyrola rotundifolia; as in most years there were no flowers. 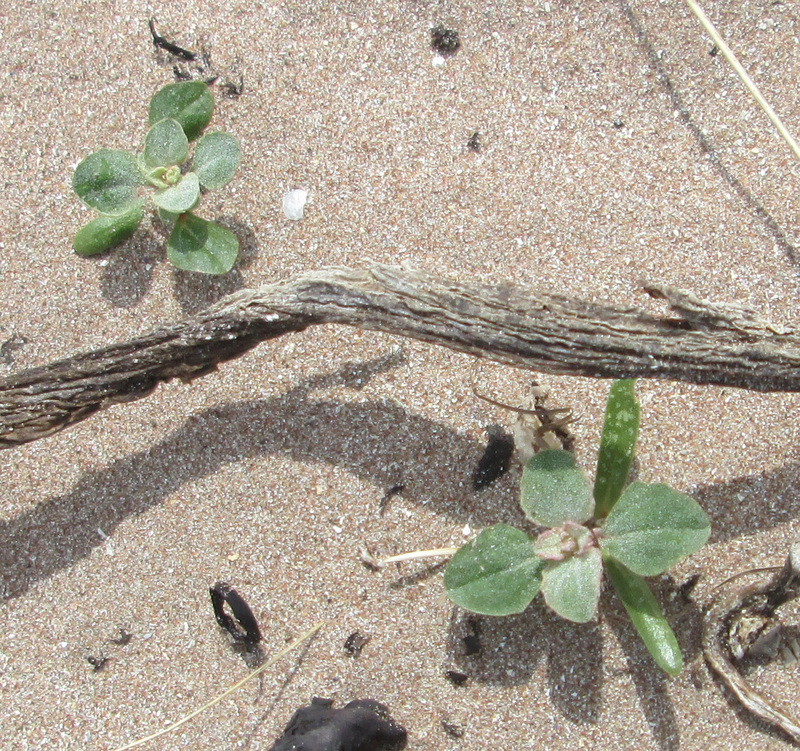 There was a lot of Atriplex laciniata (Frosted Orache) along the shore. This had been recorded at Kilmory up to 1997 but it was not found during the years of recording for The Flora of Rum. I also found six plants of Polygonum oxyspermum subsp. raii (Ray’s Knotgrass), another plant that had been recorded there before (until 1984) but not found during the Flora surveys. Maybe the grazing pressure has reduced. 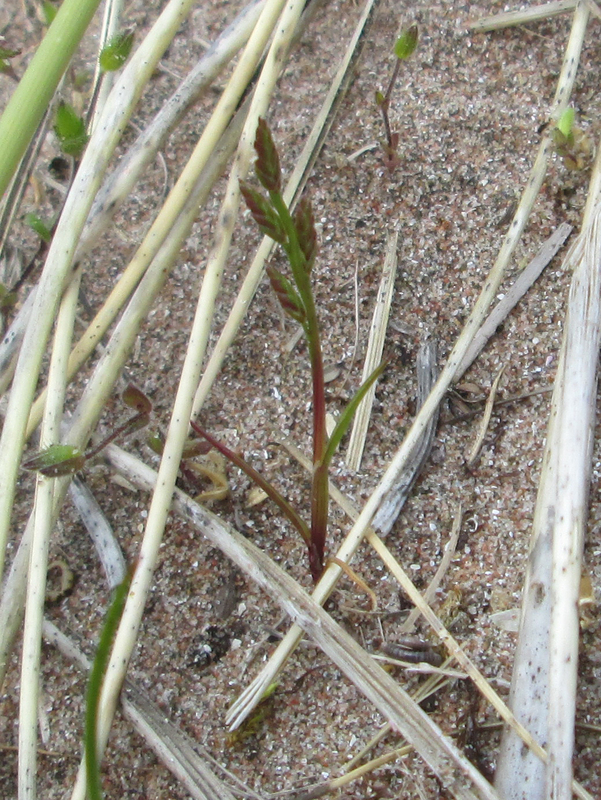 There were also, of course, lots of plants that were seen during the Flora surveys from Cakile maritima (Sea Rocket) to Ophioglossum azoricum (Small Adder’s-tongue) and Cerastium semidecandrum (Little Mouse-ear) to Equisetum x trachyodon (Mackay’s Horsetail (E. hyemale x variegatum)). In the dunes there were Garden Snails (Cornu aspersum) and in the boggy bits away from the dunes lots of Bog Beacons (Mitrula paludosa), these according to NBN being first records for Rum, though I haven’t delved any deeper into other record sources. As I couldn’t get back to Raasay from Canna until today, I chose on the way home to visit Ord to look for a known Valerianella site and, while I was in sandy beach mode, to go to Glenbrittle and see what was what. Valerianella locusta (Common Cornsalad) has been known at Ord since 1967. 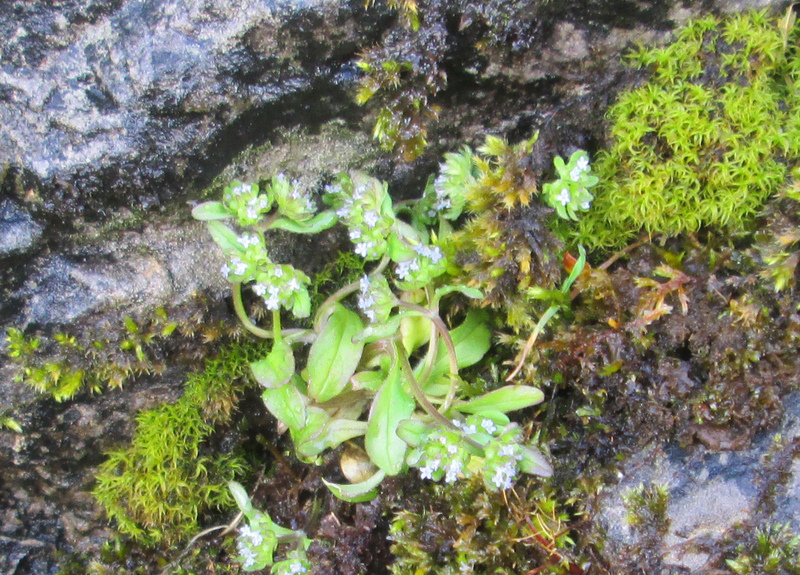 Unlike most sites in NW Scotland this is not on a sandy soil but on a boulder. I have not found this site before and there were only two plants but they look good – at least 48 years is a remarkable achievement for a tiny population of an annual. This is the only known Skye site. Nearby, there were two plants of Moehringia trinervia (Three-nerved Sandwort). Amazingly, this is the first record of this plant for Skye. There are several sites on Raasay and Eigg and an old record from Rum. Foolishly, I didn’t think to take a photo. I also spotted Arabidopsis thaliana (Thale Cress) – best found early in the season. At Glenbrittle beach there was again (like Canna) Ranunculus bulbosus (Bulbous Buttercup) beginning to flower and more Cornu aspersum (Garden Snail) – this time a new record for NG42 according to NBN. 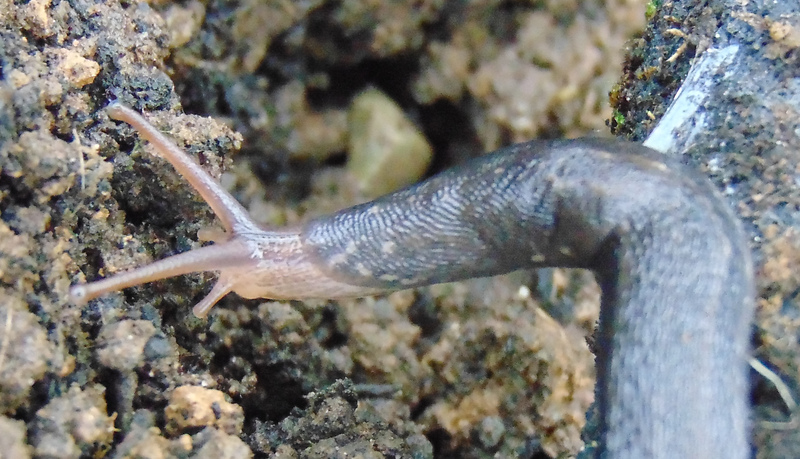 I notice that the AIDGAP guide to land snails says “occurring in woods, hedges and dunes as well as in gardens”. 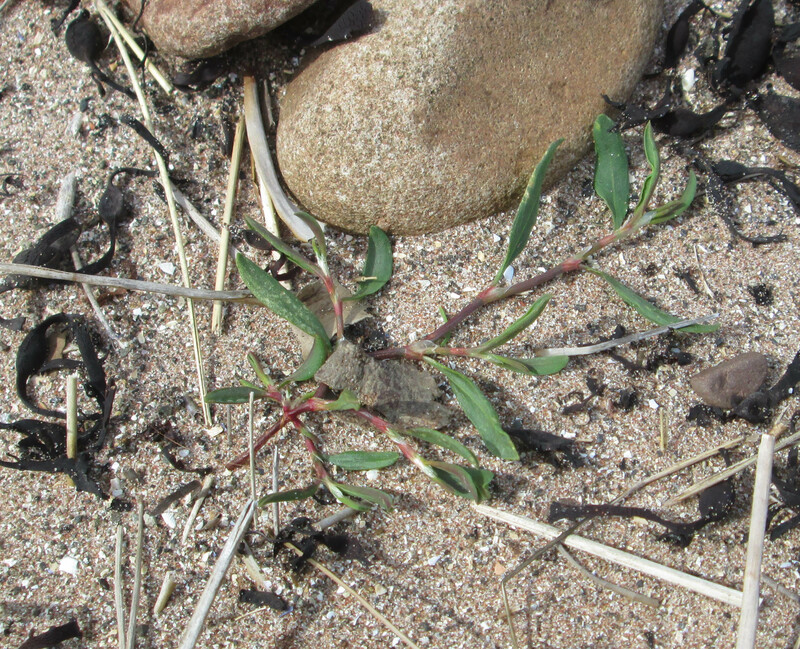 This time the dunes did contain Erophila glabrescens (Glabrous Whitlowgrass) and the sandy shore had plants known previously such as Atriplex laciniata (Frosted Orache), Cakile maritima (Sea Rocket) and Elytrigia juncea (Sand Couch). 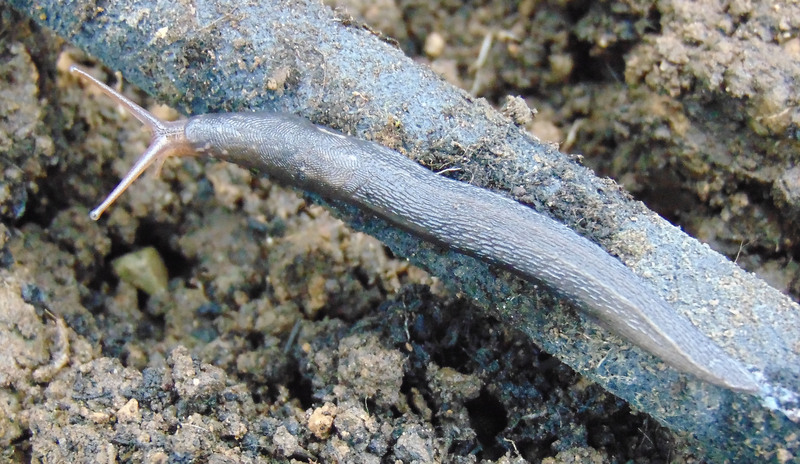 The single young specimen of Beta vulgaris subsp. maritima (Sea Beet) that Jean-François found last September appears to have been lost to the winter storms, though it might be under a pile of seaweed. 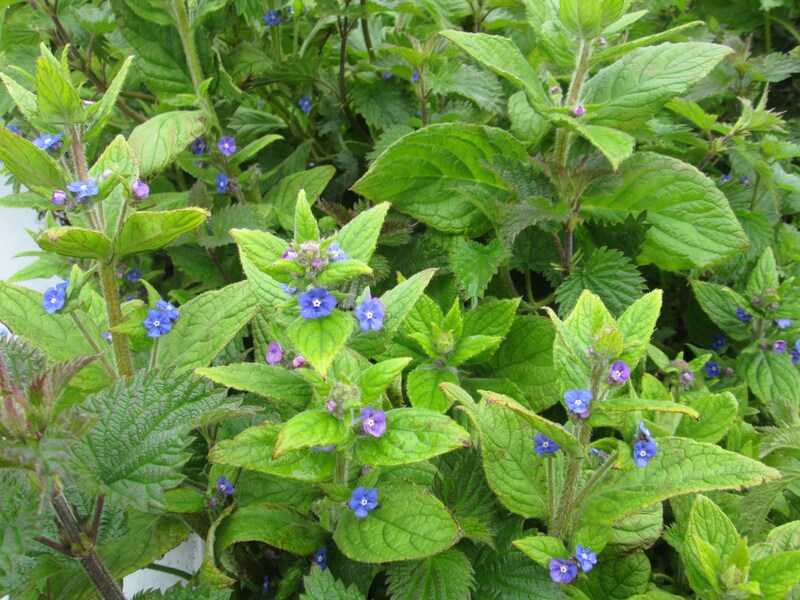 There was also a sandy hollow with at least 50 plants of Pentaglottis sempervirens (Green Alkanet). First reported from this area in 1996 by Paul Smith and Tim Rich, Carl Farmer recorded three in 2005. It has clearly done well since then. It presumably came from the same source as all the Aegopodium podagraria (Ground-elder) and Crocosmia x crocosmiiflora (Montbretia) that accompanies it. Some of the Cirsium arvense (Creeping Thistle) was covered in Puccinia punctiformis, a common rust that is seriously under-recorded.